Coriander (Coriandrum sativum, Linn.) is a plant of little beauty and of easiest culture. It is a hardy annual herb of the natural order Umbelliferae. The popular name is derived from the generic, which comes from the ancient Greek Koris, a kind of bug, in allusion to the disagreeable odor of the foliage and other green parts. The specific name refers to its cultivation in gardens. Hence the scientific name declares it to be the cultivated buggy-smelling plant. Coriander has been cultivated from such ancient times that its land of nativity is unknown, though it is said to be a native of southern Europe and of China. It has been used in cookery and of course, too, in medicine; for, according to ancient reasoning, anything with so pronounced and unpleasant an odor must necessarily possess powerful curative or preventive attributes! Its seeds have been found in Egyptian tombs of the 21st dynasty. Many centuries later Pliny wrote that the best quality of seed still came to Italy from Egypt. Prior to the Norman conquest in 1066, the plant was well known in Great Britain, probably having been taken there by the early Roman conquerors. Before 1670 it was introduced into Massachusetts. During this long period of cultivation there seems to be no record or even indication of varieties. In many temperate and tropical countries it has become a frequent weed in cultivated fields. From a cluster of slightly divided radical leaves branching stems rise to heights of 2 to 2 1/2 feet. Toward their summits they bear much divided leaves, with linear segments and umbels of small whitish flowers, followed by pairs of united, hemispherical, brownish-yellow, deeply furrowed seeds, about the size of a sweet pea seed. These retain their vitality for five or six years. The seeds do not have the unpleasant odor of the plant, but have a rather agreeable smell and a moderately warm, pungent taste. Coriander, a plant of the easiest culture, does best in a rather light, warm, friable soil. 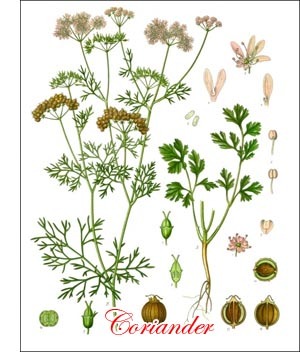 In Europe it is often sown with caraway, which, being a biennial and producing only a rosette of leaves at the surface of the ground the first year, is not injured when the annual coriander is cut. The seed is often sown in the autumn, though spring sowing is perhaps in more favor. The rows are made about 15 inches apart, the seeds dropped 1 inch asunder and 1/2 inch deep and the plantlets thinned to 6 or 8 inches. Since the plants run to seed quickly, they must be watched and cut early to prevent loss and consequent seeding of the ground. After curing in the shade the seed is threshed. On favorable land the yield may reach or even exceed 1,500 pounds to the acre. Some writers say the young leaves of the plant are used in salads, seasoning soups and dressings. If this is so, I can only remark that there is no accounting for tastes. I am inclined to think, however, that these writers are drawing upon their imagination or have been stuffed by people who take pleasure in supplying misinformation. The odor is such as to suggest the flavor of buggy raspberries we sometimes gather in the fence rows. Any person who relishes buggy berries may perhaps enjoy coriander salad or soup. Only the seed is of commercial importance. It is used largely in making comfits and other kinds of confectionery, for adding to bread, and, especially in the East, as an ingredient in curry powder and other condiments. In medicine its chief use now is to disguise the taste of disagreeable drugs. Distillers use it for flavoring various kinds of liquors.